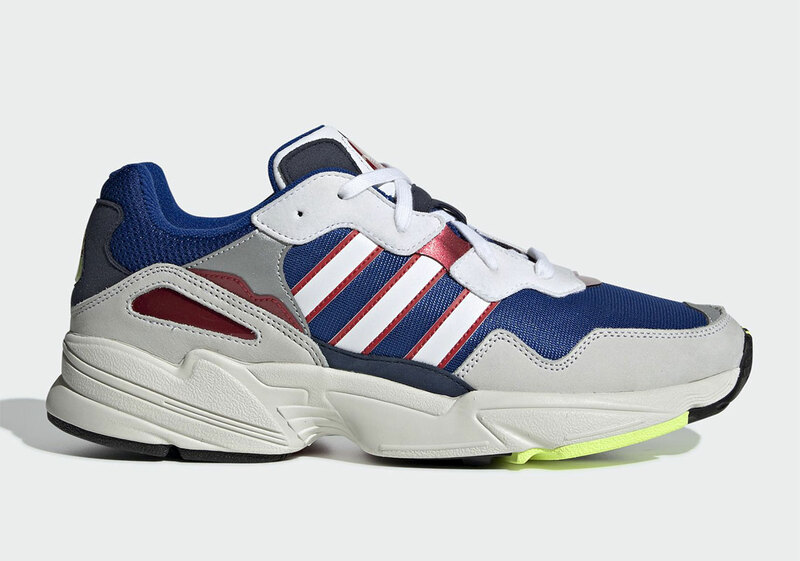 Just like the Yung 1 that came before it, the Adidas Yung 96 is a silhouette that cashes in on a trend that has still been lingering ever since Kanye West debuted the Yeezy Boost 700 "Wave Runner" back in 2017. It's surprising that the trend has caught on but with so many people fiending nostalgia they never really had, I guess it's not that much of a shocker. Regardless, people like it and for sneaker companies, that's really all that matters. Some pretty cool colorways of the Yung 96 have already made it to market and now it seems like the brand with three stripes is looking to at least add one more. This colorway features a primarily navy blue upper, while grey and white suede are sprinkled throughout. Hits of red and burgundy can also be found on the shoe, particularly near the three stripes. The signature Adidas side panel is mostly white but features a red outline which offers a pop of color. There is a lot happening with this particular model which helps it fit the dad shoe aesthetic quite nicely. So far there is no word on when these will release although according to Sneaker News, they should drop in April for $100 USD.